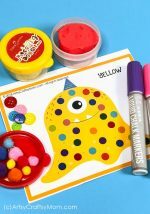 This printable Bug Theme Pom-Pom Match packet is perfect for boys or girls. It is all about bugs. 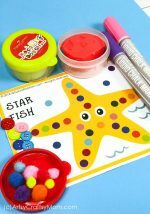 These are perfect for preschoolers and young learners to develop fine motor skills & color recognition! My toddler class is forever asking for activity mats. With spring & summer on everyone’s mind, we decided that our latest theme would be BUGS. Once we decided on a theme I came up with a few buggy ideas and got to work. Soon we were printing out and laminating. Then all we needed was some play dough, tweezer tongs & pom poms and we were all set to go bugs!! The Printable pack contains 8 sheets in a ready to print PDF, featuring 8 bugs in full color. 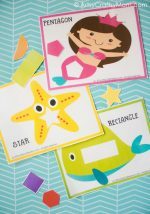 Assembly: Print and laminate each sheet for durability. Place the pom poms in a cup or bowl. Identify the color of the pom-pom and find the matching color dot in the bug sheet. Continue until all of the pom-poms cover the buggy spots. 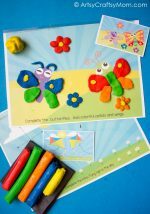 To make your own beautiful (or scary) bugs, just print out the play dough mats and laminate them or cover them in self adhesive paper. 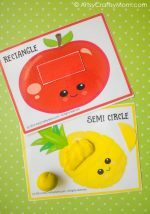 They also work great with dry erase markers or crayons, or as play dough mats too. These pom pom mats are perfect for young children to develop various skills. The act of shaping the play dough and handling the tongs develops good dexterity and control with their hands. Trying to move a pom pom from the cup to the mat is great for improving hand-eye coordination. To make it more of a brain exercise, here’s a tip.Once they get used to picking up the pom poms with their right hand, let them try it with the left. The mats are pretty open-ended, so you can try all kinds of activities to make the most of them! 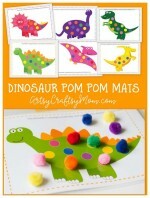 Printable Dinosaur Pom Pom Mats that your kid will Love!